This horrible tragedy that has hit Nepal this last few weeks has left me heartbroken and speechless. 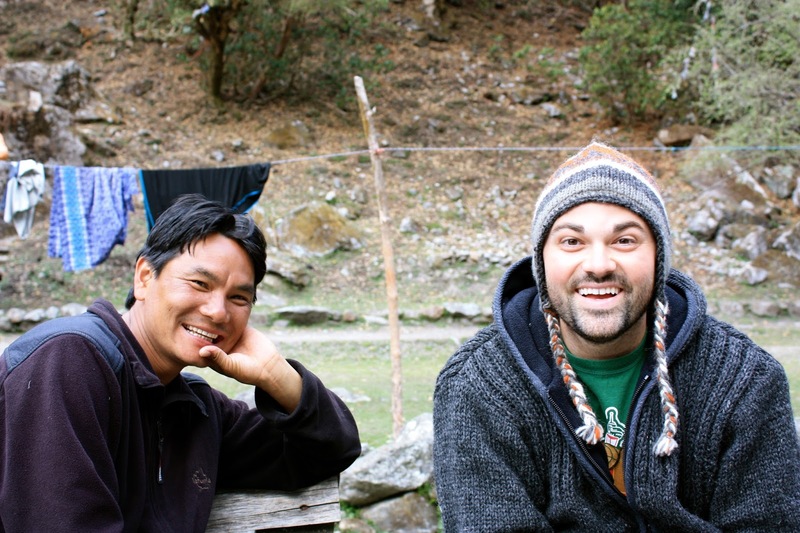 As some of you may know, myself and Jason spent a month in Nepal a couple of years ago which you can read all about here. It is a beautiful country with even more beautiful, loving and happy people. 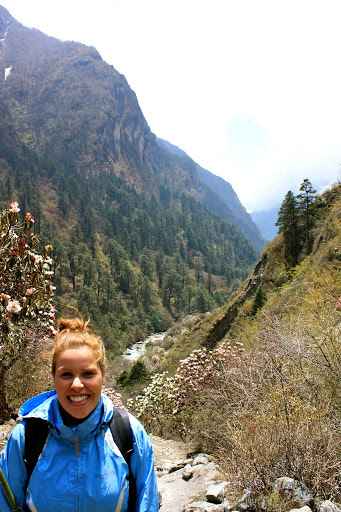 During our time in Nepal we did a trek in the Himalayas. It was probably one of the best things that I’ve ever done in my life. It was challenging, breathtaking and extraordinary. 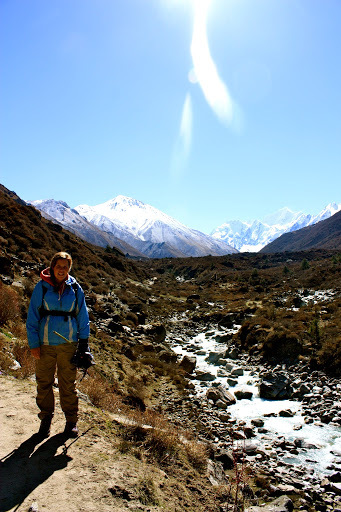 We had decided to hire a guide to help us during the trek and it is a decision that I am so happy with. We ended up spending 7 days with the lovely Bolle. He is such a great person and by having him as our guide he gave us a more in depth look at the life of a Nepali. We stayed in beautiful family homes along the way, using Bolle as a translator to get to know and understand these people more. After our 7 days together, Bolle had invited us to have dinner with his family, an invitation that we graciously accepted. He lives in Patan which is a small city near Kathmandu, in fact we managed to walk there from our guesthouse in Kathmandu which took us about an hour but, again, gave us a great insight in to Nepal and its people. 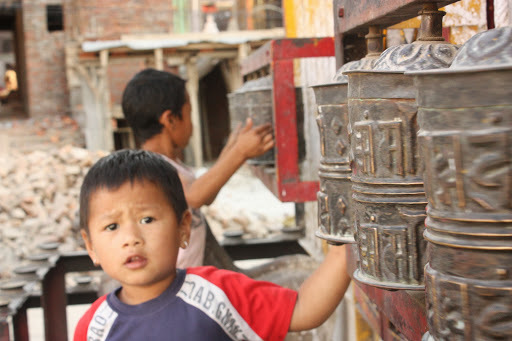 When we got to Patan, we found a guesthouse and dropped our stuff, and went to meet Bolle and his family. Most people don’t know poverty, true poverty. I grew up in a struggling family. My dad died when I was a baby, leaving my mom to bring up 4 children by herself. 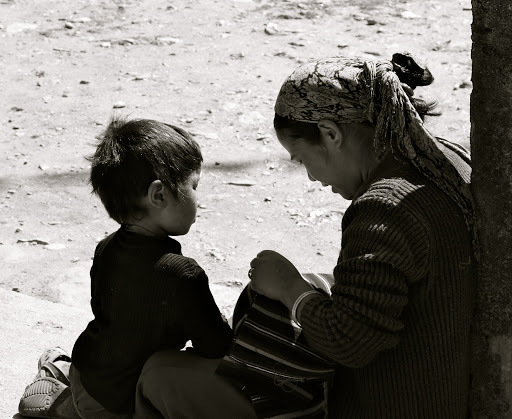 But the poverty that Bolle and his family face is something entirely different. Bolle, his wife and two children all live in one room. They have a double bed for the four of them and no bathroom. There is an outhouse outside that is used by people in the area. Even though they were obviously so poor, they also seemed so happy. The children very content in their lives and the few things that they had and Bolle and his wife in their strong pride that they hold for their two boys. The children were shy at first, but opened up once I let them take photos on our camera. After that they beamed with confidence and joy. Bolles beautiful wife was so modest but cooked us an amazing meal of Dal Bhat. We left that evening with our hearts and our stomachs full. We returned the next day with some small gifts for the kids and spent some time with them before having to return to Kathmandu. 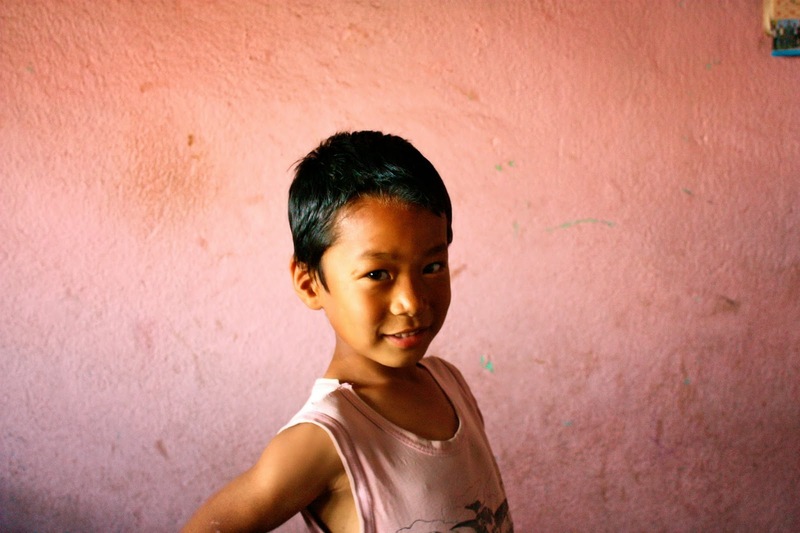 When news of the earthquake in Nepal broke my first thought was of poor Bolle and his family. I sent an e-mail to him asking if they were okay and what we could do to help. We had a nervous few days waiting for a reply, all the while seeing photos of collapsed buildings and temples in Patan. But luckily he wrote back saying that they were all safe but they lost everything. Their house, their belongings, their animals. All was gone. They were now living under a plastic roof. Myself and Jason quickly e-mailed our friends here in Korea to see if they wanted to help. Luckily between us we managed to raise $650 for Bolle and his family. It’s not a lot but I’m hoping that it will be enough to get them by for the next few months, especially since there probably won’t be many trekkers needing guides in the near future. I haven’t heard from Bolle since the second earthquake but I’m just hoping that they are all safe. If you would like to donate to the victims of the earthquakes in Nepal there are many ways. You can find a link to 10 great charities to donate to here. 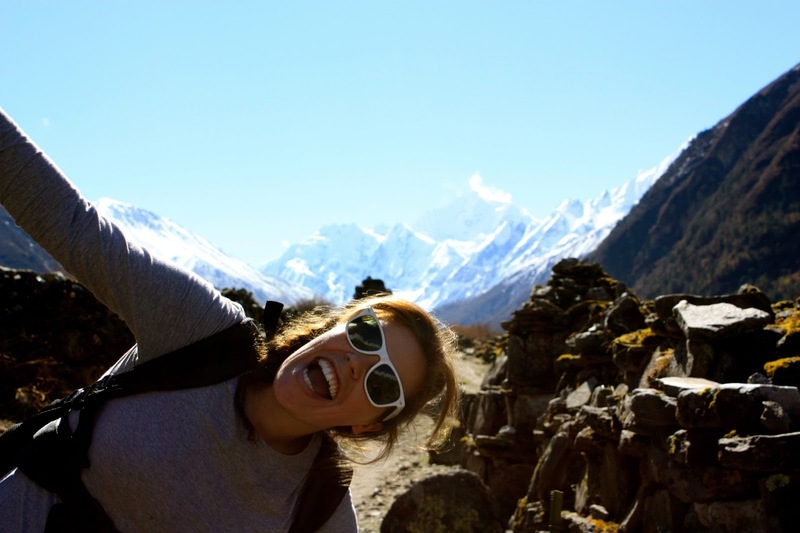 If you have been considering visiting Nepal then don’t cancel just yet. So many people in this country are dependent on tourist money and by just visiting this country you will be helping. Beautiful view of the special zone. 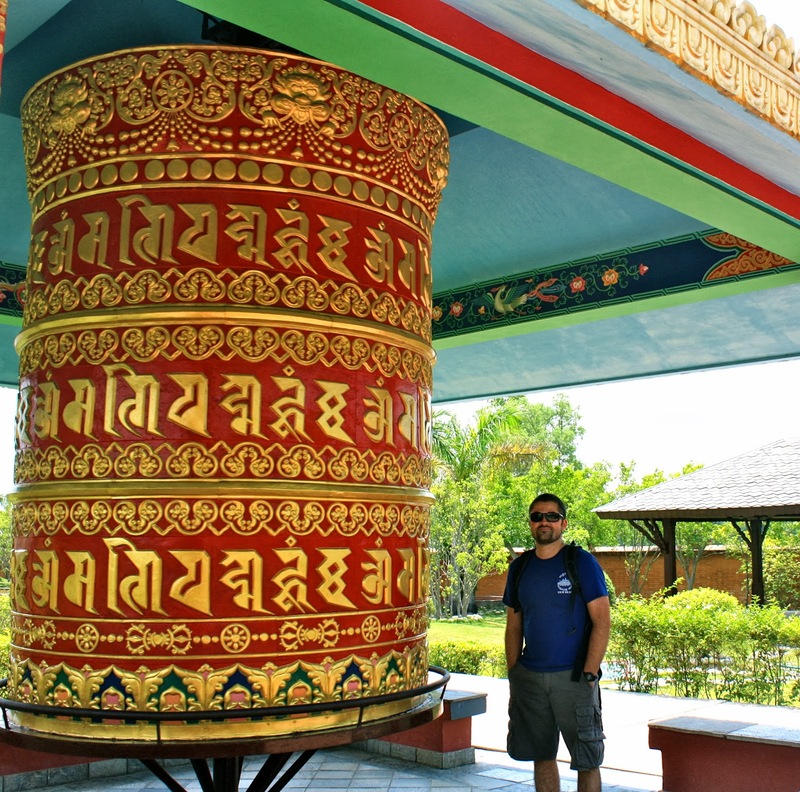 After our wonderful stay at Chitwan it was time to go to our final destination in Nepal, Lumbini. 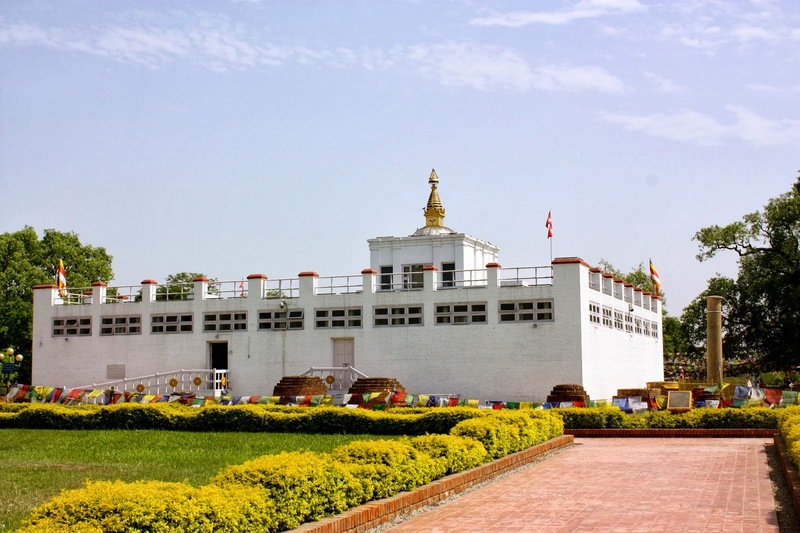 Lumbini is a famous town among all Buddhists around the world as it is in fact the birthplace of Buddha. 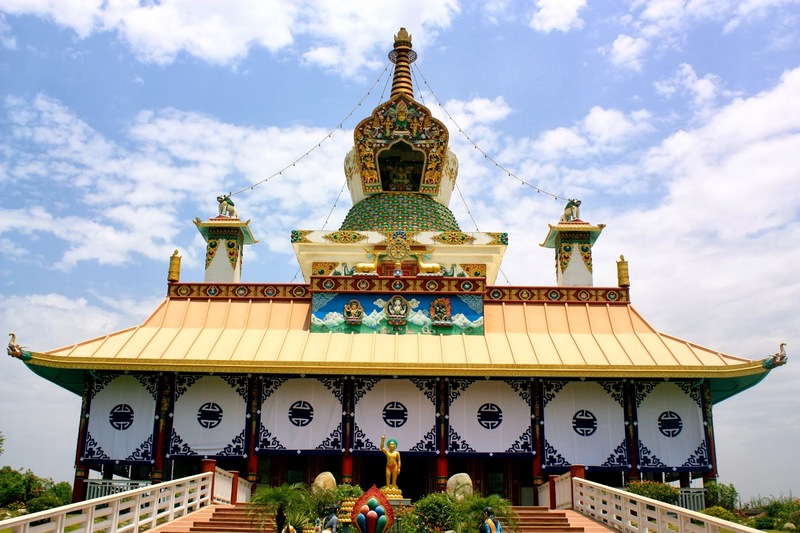 We had heard some mixed reviews about Lumbini but since it’s quite close to the Indian border and it made sense to spend a couple of days there, we were excited to see it for ourselves. First though we would be taking a local bus. I loved travelling on the local buses in Nepal, they are so vibrant with colourful hangings, pictures and beads all around the ceiling. The people that got on and off the bus were equally as vibrant. There was a big group of Nepali people on this bus that were returning to their homes after spending some time at a worship house for a guru in Chitwan. They were such nice people and were so excited to chat to us. About three or four hours into our trip we heard a smash at the front of the bus. It was quite crowded so we couldn’t see properly but all of a sudden we saw the front windscreen just collapse! A rock had chipped the glass and made it just collapse. Luckily the people sitting/standing at the front didn’t get hurt and in true Nepali style the bus stopped in the middle of the road, some men pushed the rest of the windscreen out onto the road and we were off again with no windscreen. I have to admit I was secretly delighted because we now had a lovely breeze coming in through the bus which helped a lot in the 40 degree heat. I was a bit worried for the driver though as we were driving on high mountain roads and the wind that was coming in was quite strong that I couldn’t keep my eyes open if I looked straight on so I can only imagine how the driver felt. 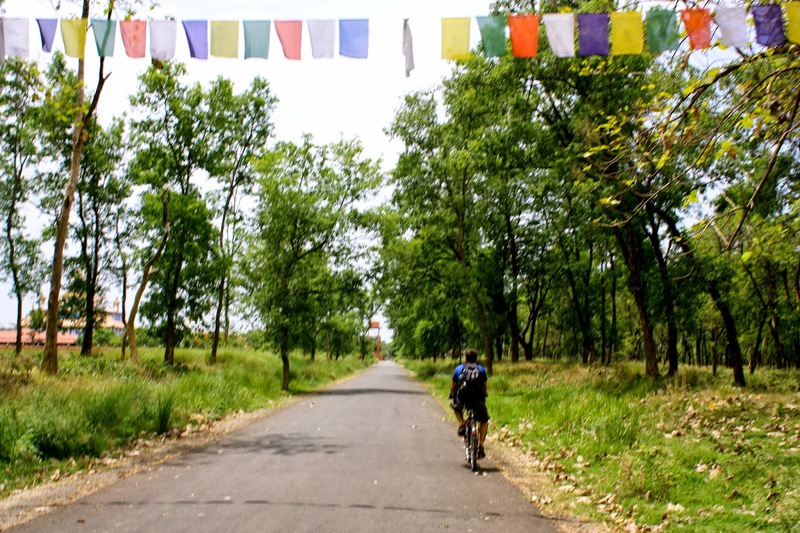 But this is Nepal after all so we made it to Lumbini in one piece. 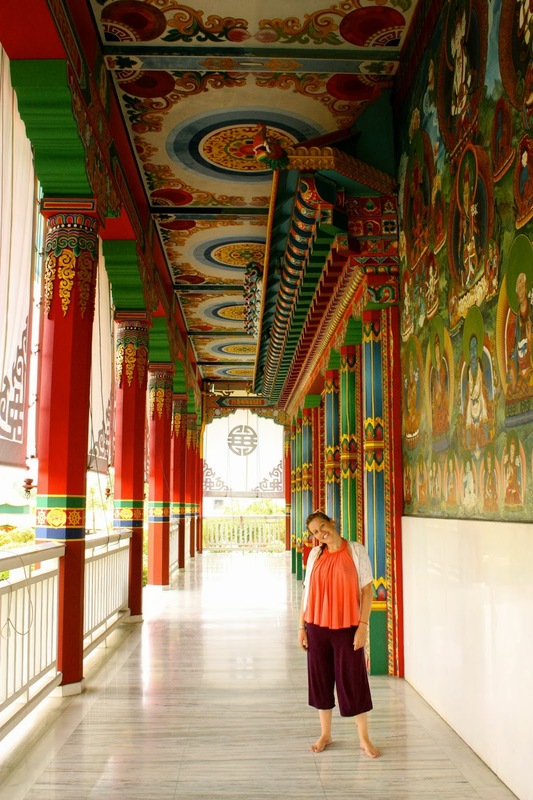 Lumbini was an interesting town. It was mainly one main dirt street and was quite devoid of tourists. 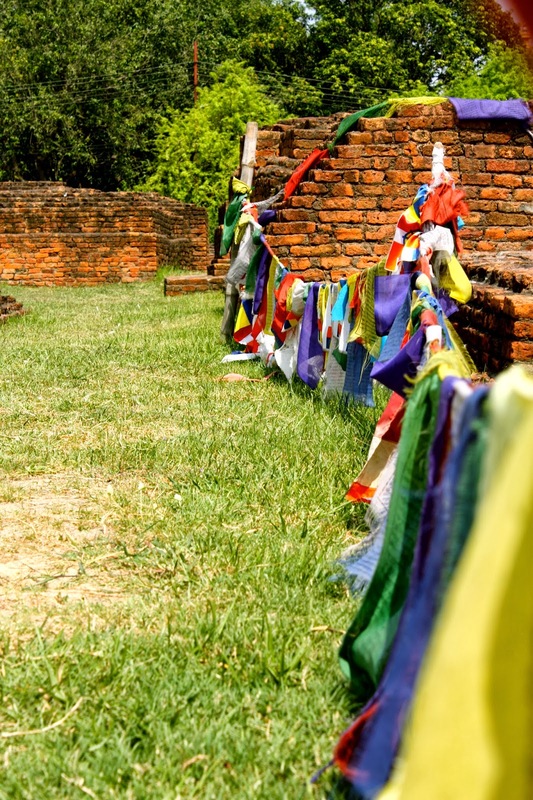 Lumbini isn’t a place that many western tourists visit and when they do they usually stay outside of town. Since we were on a tight budget we found a little guesthouse on the main street. 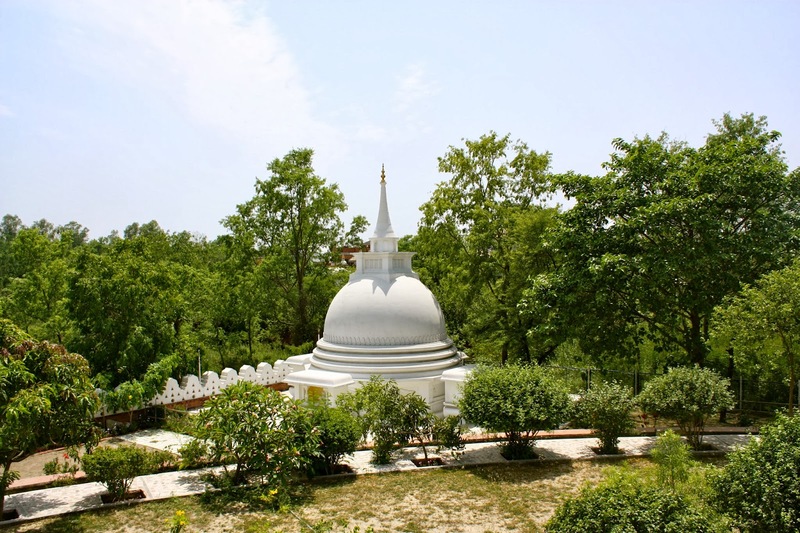 The main problem that Lumbini had was that it never had any electricity. Most places in Nepal never had any electricity which was fine but it was about 40 degrees celcius when we were staying there and no electricity=no fan which means we were just dying from the heat for our entire time there. 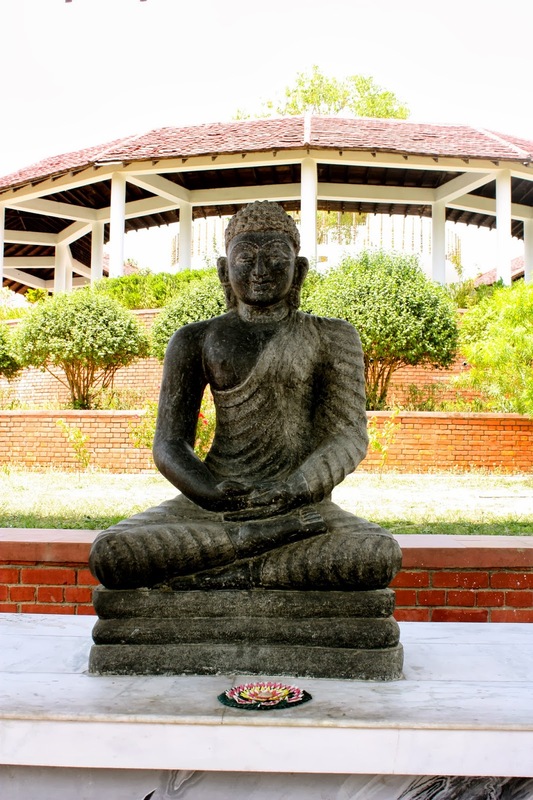 What makes Lumbini so interesting is that because it is Buddhas birthplace it is very sacred for many Buddhists. 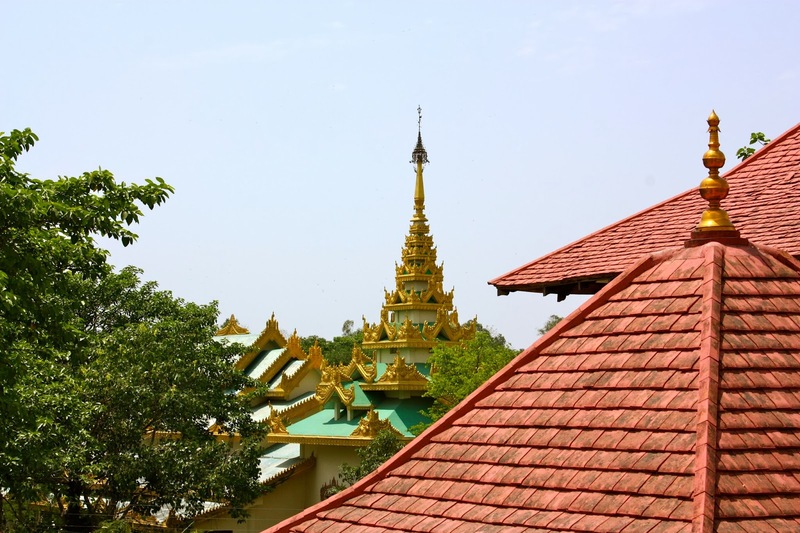 The government has set off a huge plot of land near his birthplace for Buddhist countries all over the world to build temples there. 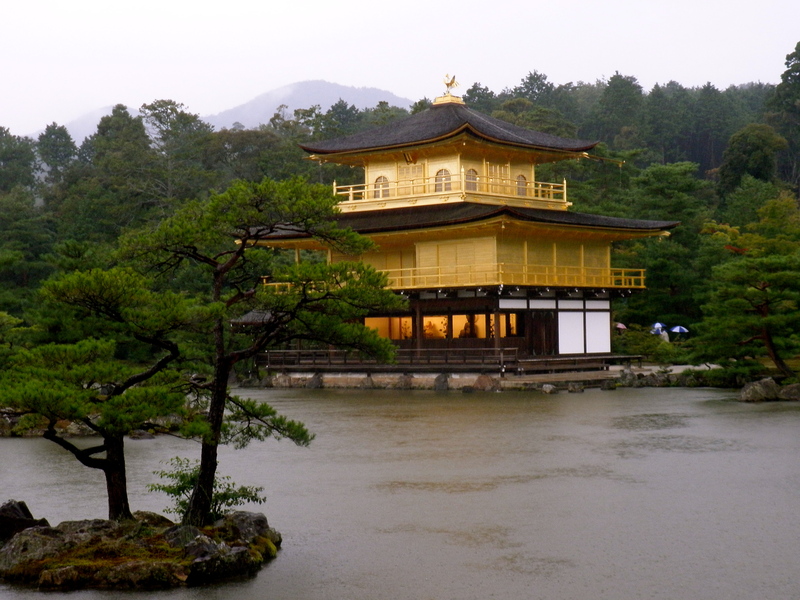 So in this one small area you can go around to all of the temples and see the differences. 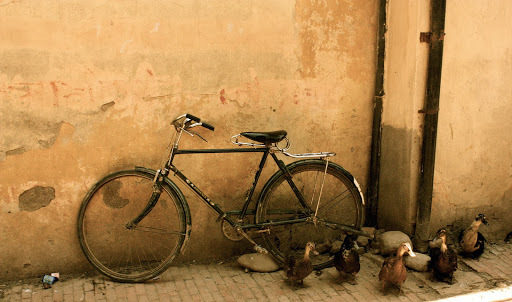 We decided to rent bicycles and cycle around. That day we got to see Chinese, Vietnamese, Japanese, Cambodian, Burmese, Nepalese and Laotian temples. We probably saw more but I have forgotten due to the extreme heat that we were cycling around in! the way it glistened in the sun was breath-taking. I can’t remember which temple this was…maybe Cambodia?! It was great fun though and we were usually the only people in the temples. It was so interesting to see the differences among the different countries. 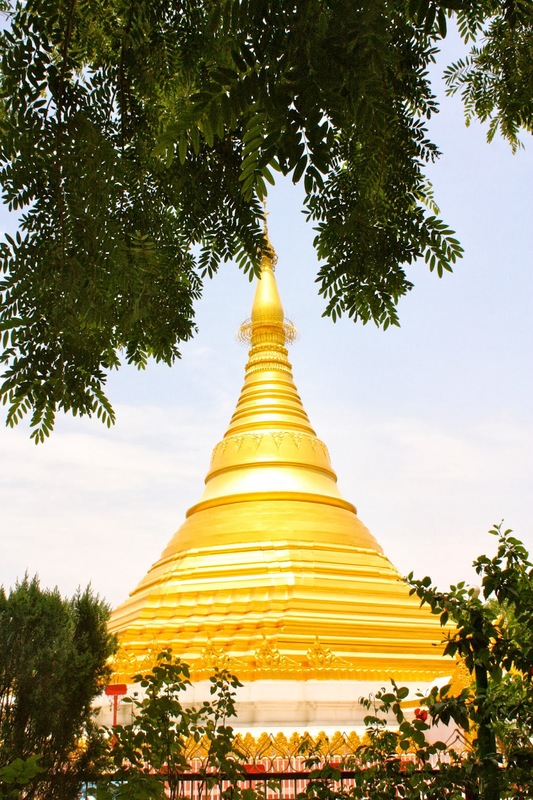 There was also many other temples, including a Korean one, but we got lost along the way and couldn’t seem to find them, we also couldn’t face cycling around during midday in the heat so we decided that it was time to go and see Buddhas birthplace. 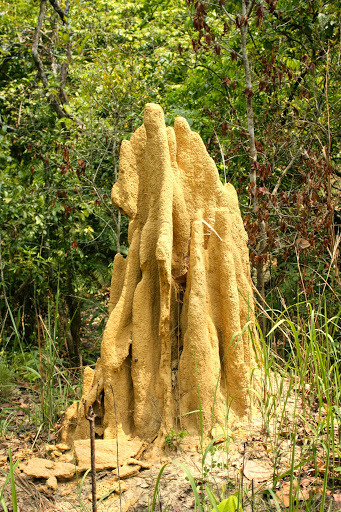 His birthplace is still intact and you can see the remains from the area. They are covered and protected by a building. It was amazing to see the exact spot and to see all of the offerings that people have left for him. It was a huge sea of red around the area that he was born due to people putting the same stuff that tikkas are made from around it. There was also a beautiful old temple next to the building which was nice to walk around. 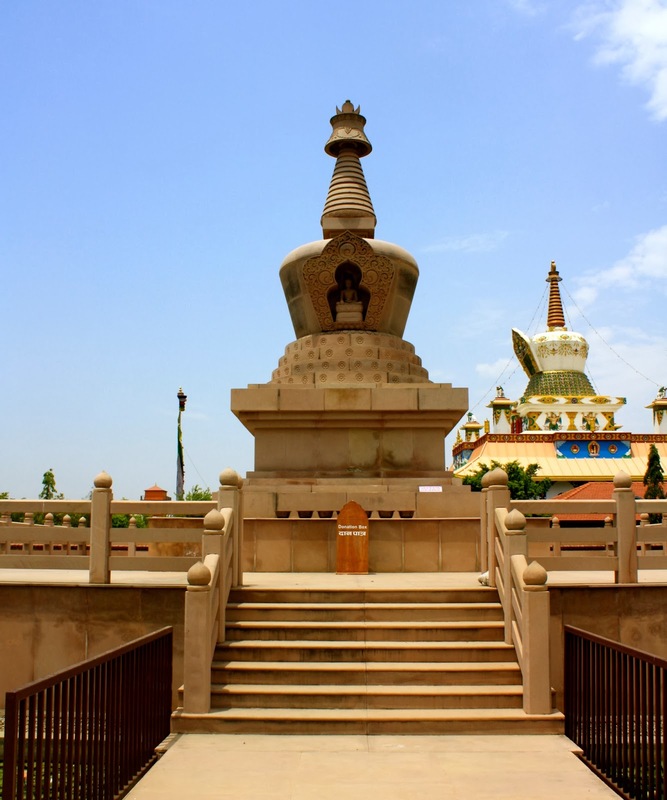 The group of stupas that are around Buddhas birthplace. 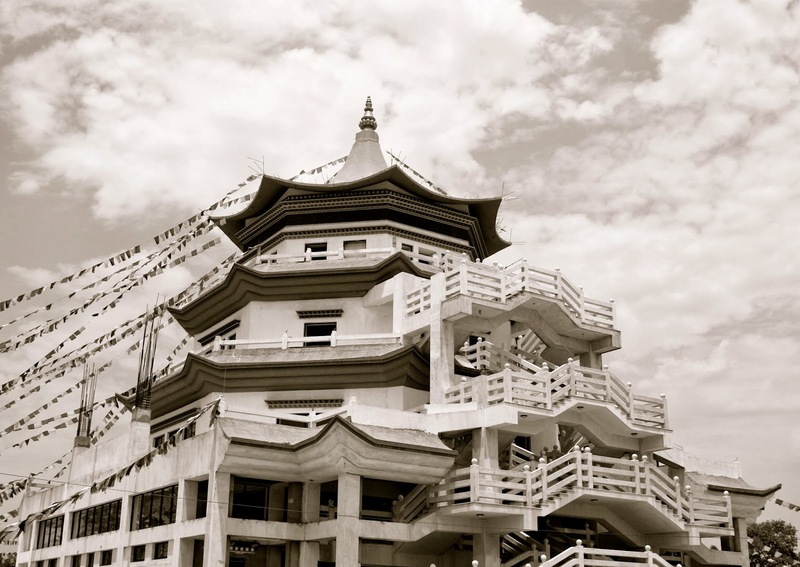 The building where Buddhas birthplace is being preserved. We also got to see the Ashokan pillar which has an inscription on it that is said to be the oldest in Nepal. 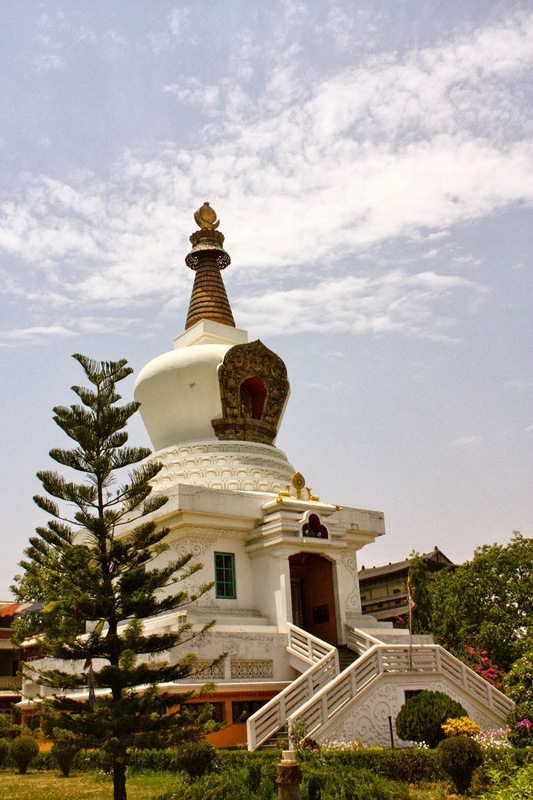 The inscription grants Lumbini a tax free area in celebration of Buddha being born there. Unfortunately I cannot remember the name of our guesthouse and have searched through my many cards that I have kept from our travels and don’t have one from that particular one. But if you get off of the bus just in front of the main street it is the first guesthouse on the left. It was cheap enough and had a rooftop restaurant. I have also heard that the Korean temple does temple stays there which could be interesting. You can spend the night but cannot have any alcohol, smoke or play card games there and must stay quiet while there. We booked our bus to Lumbini through our guesthouse in Chitwan. The only bus that goes from Chitwan is a local bus that leaves once daily, I think. 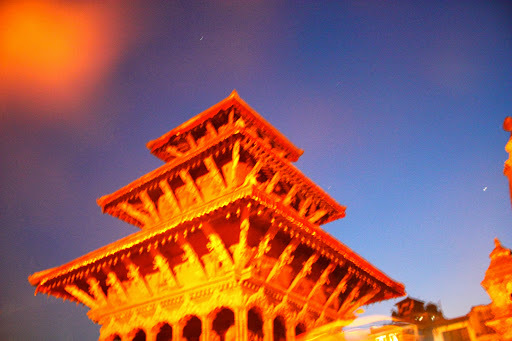 You may be able to get tourist buses from Pokhara or Kathmandu as they are more popular places. From Lumbini to the border we caught a tourist bus that goes there early in the morning (about 8:30 a.m) It was waiting at the top of the main street in Lumbini. It stops a couple of kilometers from the border so we had to get a cycle rickshaw to the border itself for a little bit extra. There are plenty of rickshaws waiting when the bus pulls in. After recieving our Indian visas in Kathmandu it was time to finally bid farewell to this city that we both fell in love with. Our next destination was Pokhara. 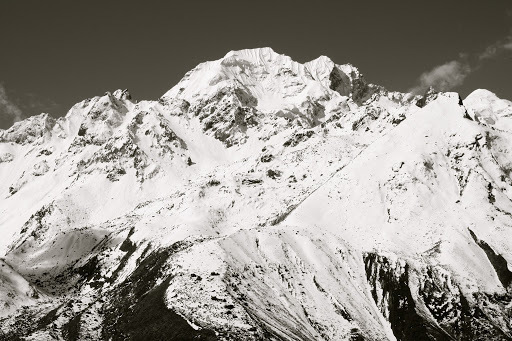 Most people visit Pokhara because it is the beginning point of many treks in the Annapurna range. 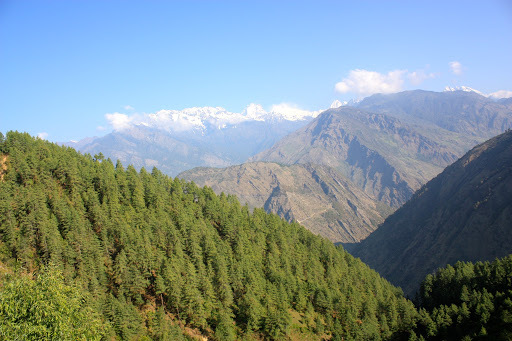 Since we were finished with our trek we were mainly going there to relax and have a very lazy week. Pokhara is situated on a big lake and has a couple of short day hikes nearby from which on clear days you can see the Himalayas. We took a bus there and after looking through tripadvisor, decided to stay in the Iceland guesthouse. Even though we hadn’t booked, the owner happened to be at the bus station when the bus arrived and gave us a free ride to the guesthouse. We were very impressed when we saw it, it had beautiful old rooms with high ceilings and lovely wrap around balconies. The price was a little above what we had hoped for but luckily the owner dropped it for us since we would be staying for 5 days. Unfortunately I can’t report much on Pokhara as we took those 5 days and just ate, slept and relaxed. We did go to a bat cave one day. The guide book said that over 1,200 bats live in this small cave so were looking forward to seeing that. Unfortunately when we arrived we found out that it was mating season so there were about 10 bats there. 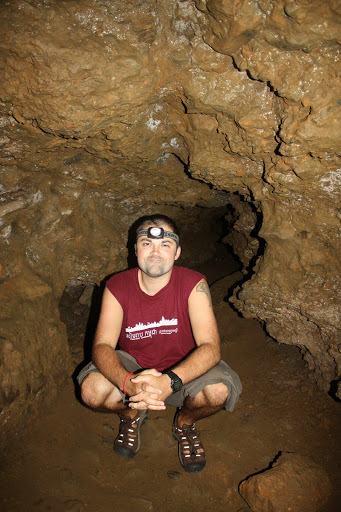 Jason crouching inside the bat cave. The weather was mainly cloudy for our stay so we decided to not do any of the short treks as there would be no views. 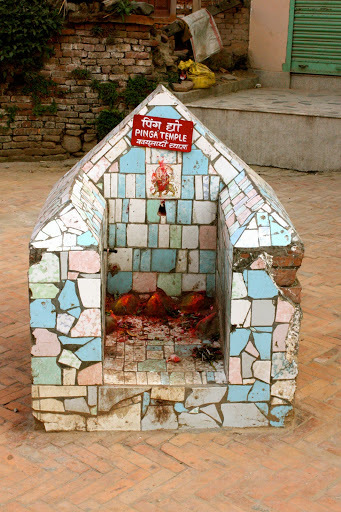 Pokhara was a strange little place as it seemed to be a town set up purely for foreigners. 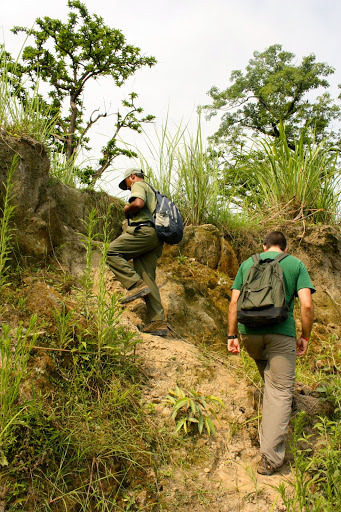 At the beginning it was nice, eating pizza and fresh bread every day but after a while we got bored and were ready for our next destination…Chitwan National Park. 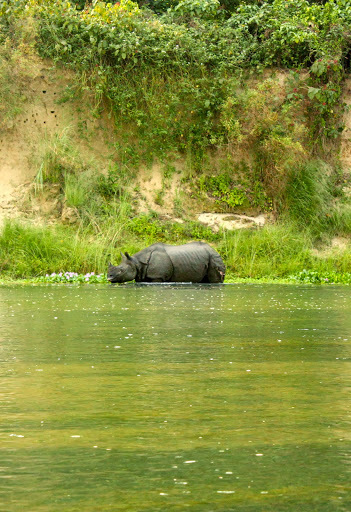 There are 2 main reasons to visit Chitwan and they are rhinos and tigers. Tigers are very elusive and sleep during the day so we knew that our chances of spotting a tiger were very low but we both really wanted to see a rhino. Once again after looking on tripadvisor (our savior while travelling) we found the Chitwan Gaida Lodge and hoped to get a room there. 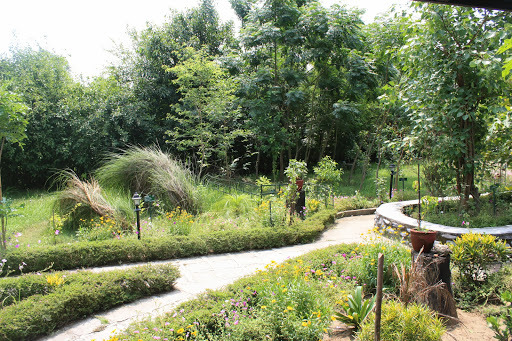 Before I go any further I want to say that if you ever visit Chitwan you must stay at Gaida Lodge! It was one of the best places that we stayed throughout all of our travels. Moving on, we arrived at the bus park and Gaida Lodge had a jeep waiting and had rooms available so we jumped on. Once we arrived the staff had cold lemonades waiting for us and showed us our beautiful room. We were staying in a bungalow with a nice balcony where we could listen to all of the sounds from the jungle (that was just across the road from us). That evening we booked our activities for the next couple of days which were a canoe ride down the river, a full day jungle trek and then a half day jeep safari. 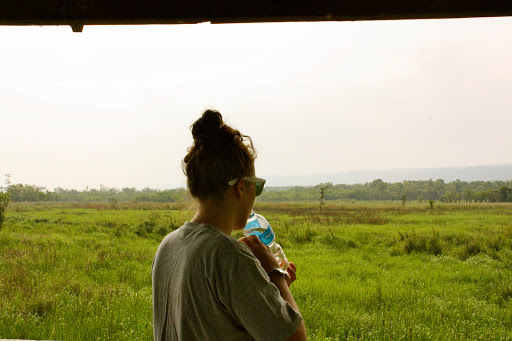 We were determined to see some wildlife!! That evening one of the guides , Bishnu, brought us and another couple out for a walk around the area, we got to see the government owned elephants. 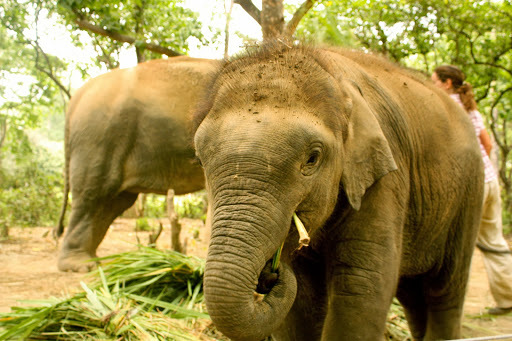 We found out that a lot of times wild elephants come into the area and impregnate the female working elephants. We also got to see some birds and rhino poo. (so close!) When we arrived back after our walk the staff were waiting for us with some cold drinks and nice cold wash towels to freshen up with. It were these little extras and the fact that the staff were incredibly friendly that made Gaida so wonderful. I got pretty excited when I saw these buffalos…mistaking them for rhinos. The next morning we were up early to begin our morning canoe ride. I was hoping to see some wildlife but I wasn’t feeling lucky as I always seem to miss out on animals. 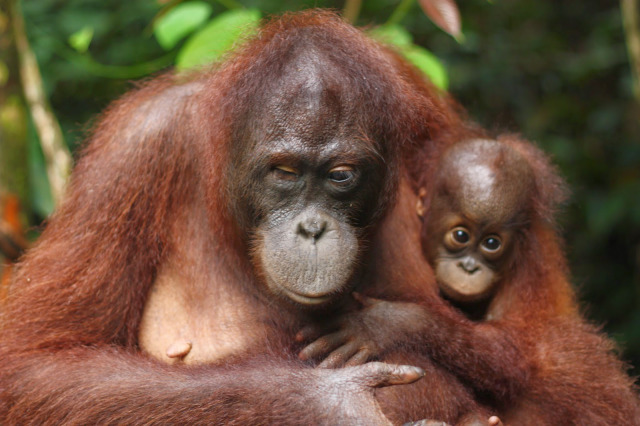 For instance, while in Borneo we did a jungle stay where you are practically guaranteed to see a wild orangutan, Of course there were none to be found while we were there. While I was diving in the Great Barrier Reef all I wanted to see was a turtle, unfortunately my air ran out quickly so I had to go back up about 5 minutes before the others…in that 5 minutes they all saw a turtle. You get where I’m going with this. Jason inside our dug-out canoe. 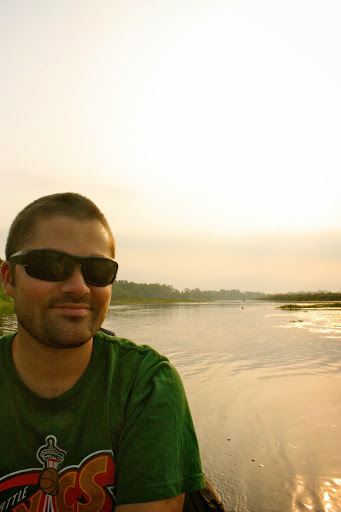 Myself, Jason, Kristel and Gavin set off with Bishnu and a local canoe owner and began our animal spotting. 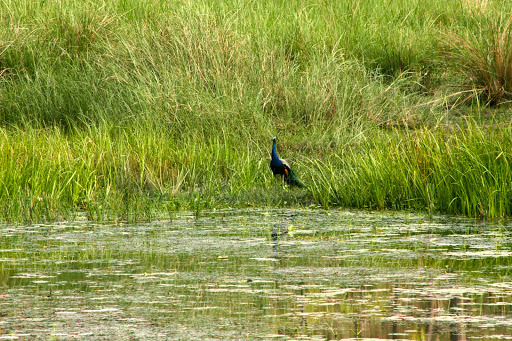 Bishnu had told us that usually the morning canoe rides are mainly about bird watching. It was so peaceful on the water and we saw so many birds, then after about 15 minutes we spotted our first crocodile, he was quite far away but we managed to swim up close to him before he went under the water. 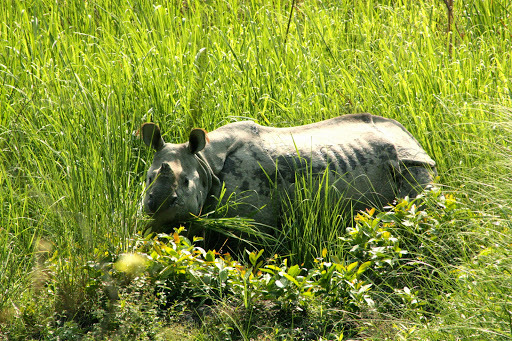 Then as we turned a corner Bishnu saw a rhino a bit of a distance away. We all fell silent as we got closer and closer to him. He was wading in the water so close to us. He noticed us but then went back to grazing on the grass nearby. We sat for about 10 minutes watching him, he was so beautiful. One of the crocodiles that we saw. Asian rhinos look different from African ones in that they look like they are wearing full body armour. I was so content after seeing that one that when we saw a second one I couldn’t believe our luck! This one didn’t like us hanging around and wouldn’t keep his eyes off of us for the whole time we were there. But as we drifted away he went back to his business. 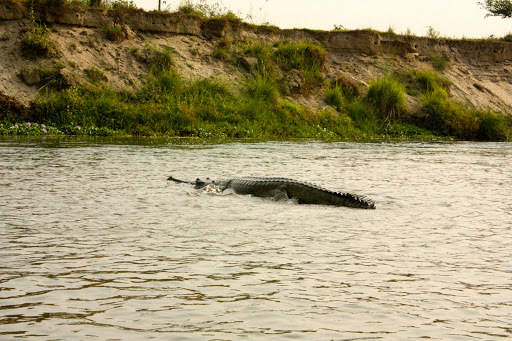 It was right around that point that we spotted another crocodile. He went under the water as we were getting close to him but while looking for him he came up right next to our boat and swam away. It was crazy seeing him so close! 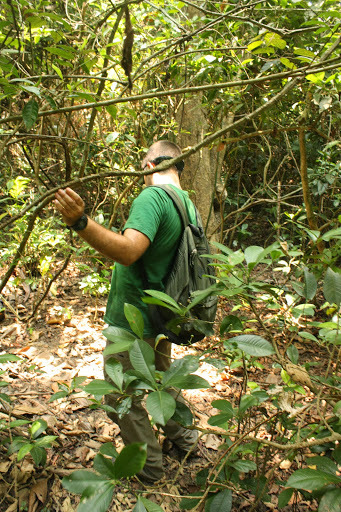 After the amazing canoe ride it was time to get out of the boat and climb up into the jungle. Bishnu gathered the four of us around for a serious chat. He warned us that we must not make any noises and to always follow him and if a rhino comes and tries to charge at us to try and climb up a tree. It was at that point that I got a little scared. We were in a jungle where tigers, rhinos, sloth bears and elephants live and we were walking around with no protection whatsoever! Jason and Bishnu just after climbing out of the canoe and ready for our jungle walk. The first area that we were going to be walking around was a long grass area. The grass was taller than all of us and we all walked around so silently pausing every time we heard a noise. 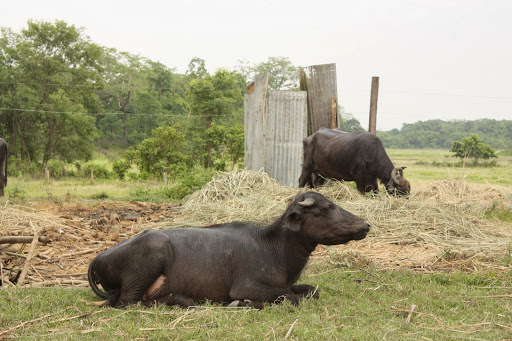 Every once in a while Bishnu would make us pause and then check the grass around us. While we didn’t see any animals we did come across some tiger pee, it was quite fresh which meant that a tiger had been there maybe a couple of hours beforehand. 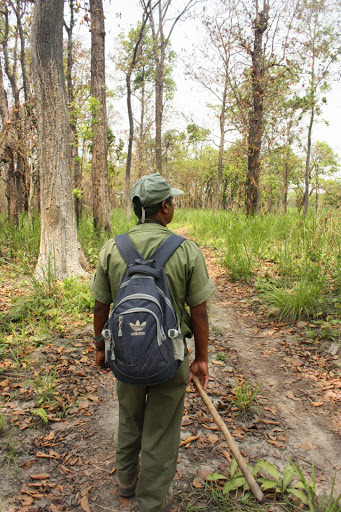 After the long grass area we got into a wooded area, here we saw some deer, a snake and were tracking some wild buffalo but lost the track before we could find them. It was close to midday now and to say it was hot is an understatement. It was probably in the mid 30’s so we found a shaded spot and ate from the delicious packed lunch that Gaida Lodge had made for us. We then continued walking until we found a watch tower. It was so hot and we didn’t have any water so we decided to stay here for a couple of hours to get out of the sun and to try and spot animals from the high vantage point. 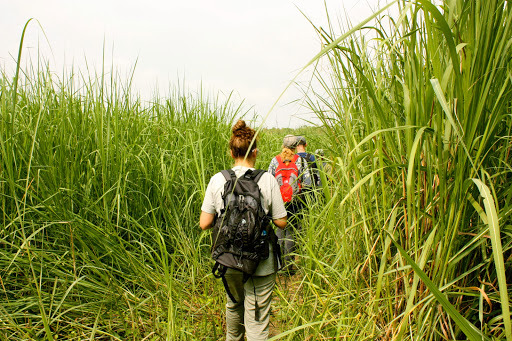 The long grass in Chitwan jungle. 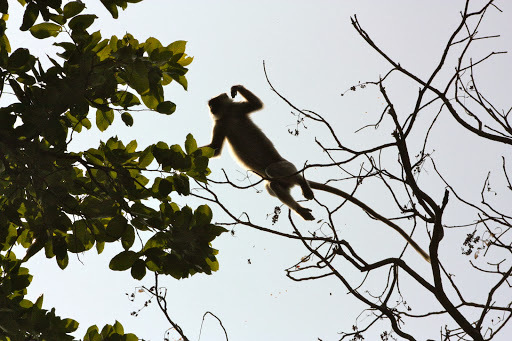 Me looking out at the jungle from the watch tower, desperately trying to spot some wildlife. 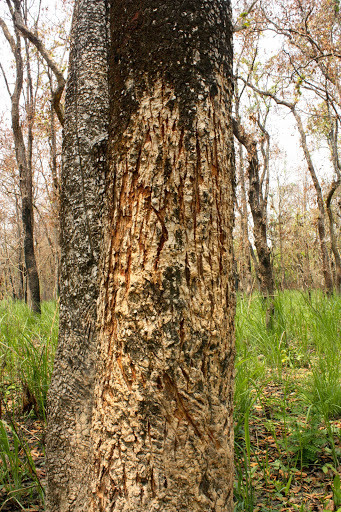 Some claw marks, Bishnu thinks they are from Sloth Bears. 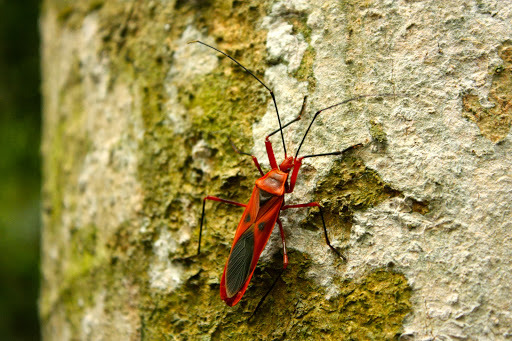 These beautiful bugs were everywhere! At this stage you are so desperate to see something that every grass that moved we were sure there was a tiger hiding behind it! Once it got a little cooler we decided to head back towards the entrance of the park which would take a couple of hours. 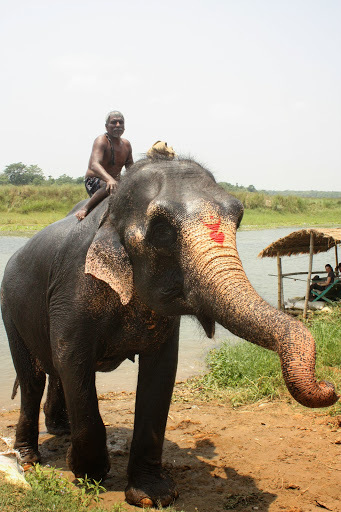 In this time we saw some working elephants and more deer. As we were walking all of us were dreaming about getting back to the lodge so that we could have some icy cold baths. My fingers swelled up so much from the heat that I couldn’t intertwine them. While getting closer to the entrance all of a sudden a massive hail storm began. I’ve been in lots of hail storms in Ireland but none like this! The hail was actually the size of golfballs and hurt so bad when it landed on you. Luckily it only lasted about 15 minutes and before we knew it we were back at Gaida with some nice cool drinks waiting for us. 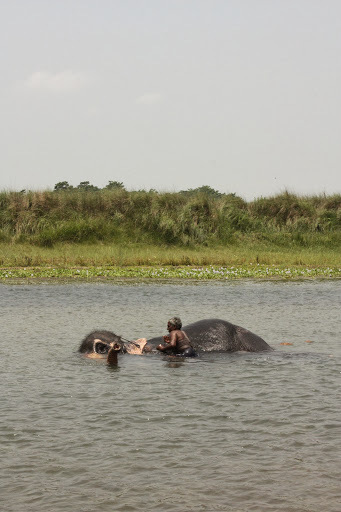 The next day we had a free morning so we went down to the nearby river to watch the elephants being bathed. Then it was time for our afternoon jeep safari. Since we hadn’t seen any rhinos during our jungle walk the day before, we were hoping to see some today. About 10 minutes into our drive we were all startled by a rhino right next to the road. Unfortunately I think he was a bit more startled as he immediately began charging at the jeep. Luckily he seemed to come to his senses a couple of seconds later and ran the other way hiding in the bushes. I was so scared when I saw him charging but it was incredible to get to see him so up-close. 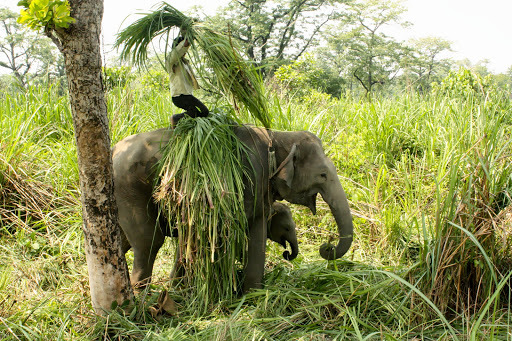 During the next couple of hours we would see 3 more rhinos, monkeys, wild peacocks and working elephants. It was an incredible experience for both of us. We were both so happy with the animals that we had seen and after hearing that the night before a tiger had come in to town and mauled 3 locals to death we weren’t too upset about not seeing one. The next day was to be our final day in Chitwan and with no more activities booked we spent the day with Kristel and Gavin by a neighbouring hotels swimming pool playing with some Indian kids. This is a working female elephant and her baby that we saw during our jeep safari. 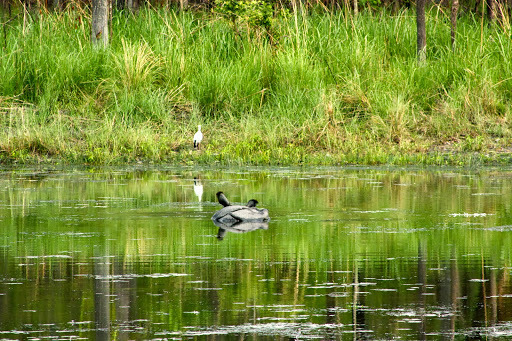 A rhino in the lake, the bird was perched on top of him for the longest time. Chitwan was definitely one of of the highlights of our trip and would definitely reccommend visiting it for anyone that is in Nepal. We wanted a guesthouse that was close to everything but not too close and the Iceland Guesthouse was perfect for us. It is down a small peaceful road with other guesthouses there but only a 3 minute walk to lakeside. As I already mentioned Chitwan Gaida Lodge was an amazing little guesthouse. The staff were the most welcoming of any place either of us have ever been and always have a smile on their faces (seriously…even at 5:30am!) They also really try to create the best itinerary that suits you and try to keep the costs down as much as possible…highly recommended! We organised all of our activities through Gaida Lodge and most other guesthouses would have this facility. 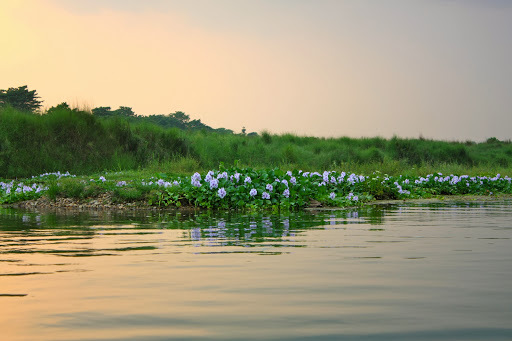 There is no need to book anything before arriving in Chitwan. Jason enjoying a beer after our jeep safari. 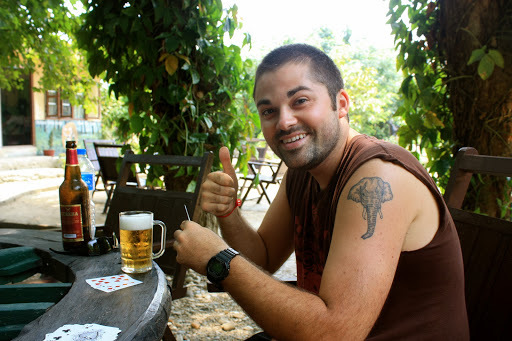 While we were trekking our guide Bolle had invited us to have dinner with his family in Patan. Of course we accepted the invitation since we were planning on visiting Patan anyway. 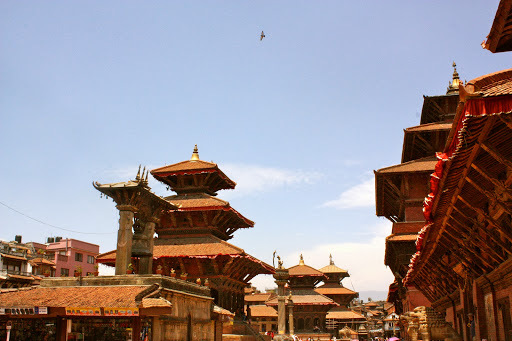 Patan is a small city on the outskirts of Kathmandu, in fact it’s so close that we walked there from Kathmandu. 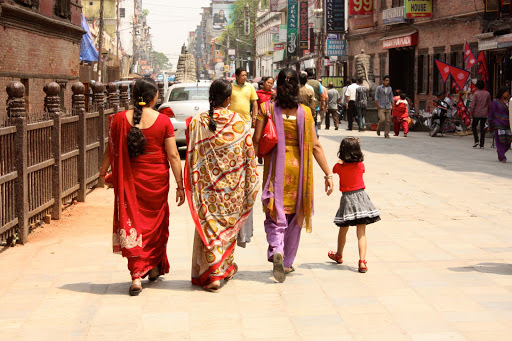 It was an interesting walk, it took about 1 hour and it allowed us to see the real Kathmandu outside of the Thamel area. While walking we noticed that many roads were closed due to protests that were happening, we weren’t sure what the protests were about but it was interesting to see. 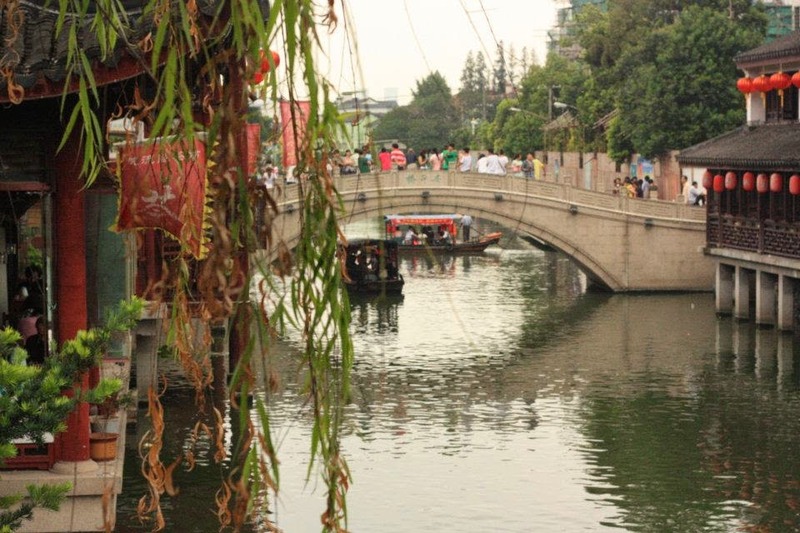 We also had to cross a bridge over the most polluted river I have ever come across. The smell was awful and there were poor cows down inside it trying to scavange some food. Once we got to the city walls of Patan we had to pay a fee to enter the city. We then got a tag that we had to wear while inside. 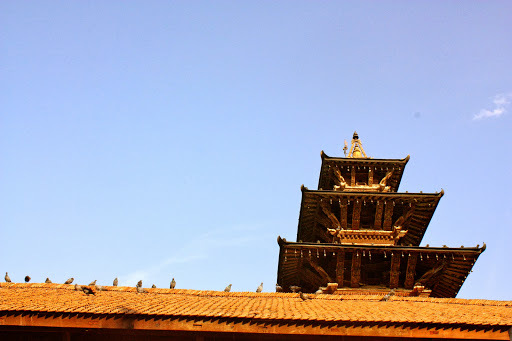 Patan is a beautiful city and famous for it’s rich cultural heritage. The Durbar square of Patan is probably the most beautiful square I’ve ever seen. 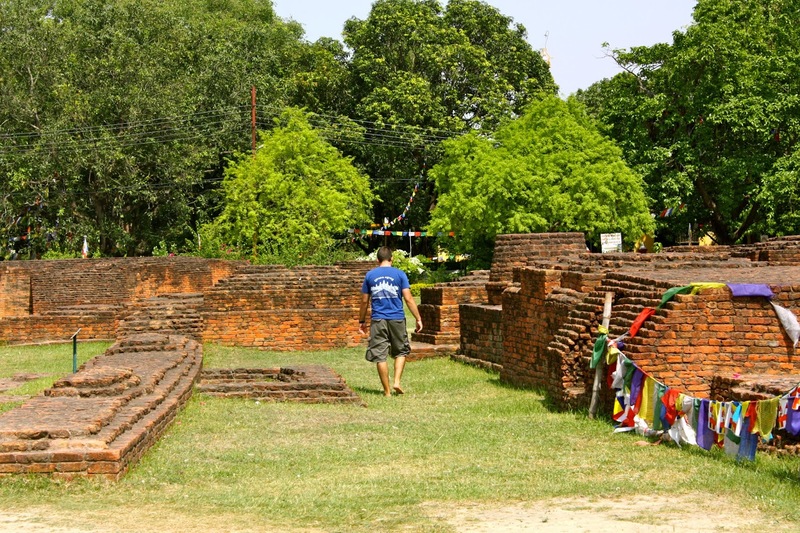 it is full of old temples and surrounded by old buildings, no cars are allowed either which makes it even better. 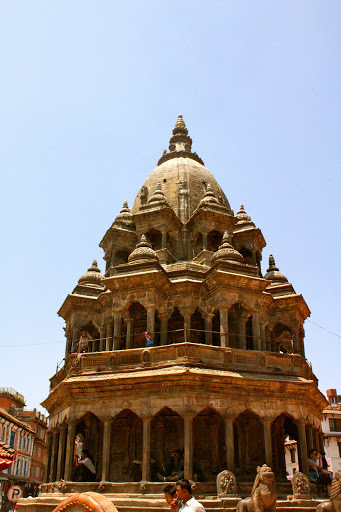 After walking around for a while we found our guest house, unloaded our bags and decided to explore Patan. 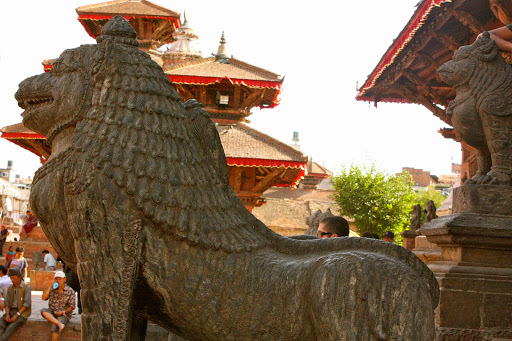 Patan is a popular day trip destination for many travellers but few stay the night here. 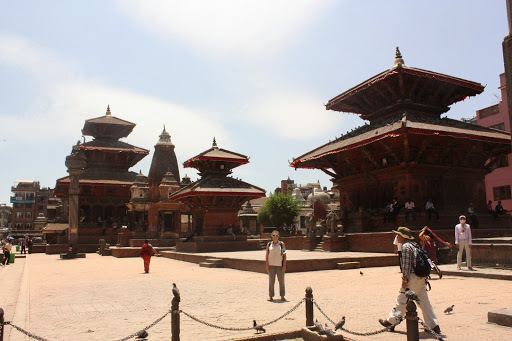 We are so glad that we stayed the night and got to see the Patan without the tourists. We were supposed to meet Bolle in a couple of hours so we found a rooftop and enjoyed a nice lunch while looking over the beautiful rooftops of Patan. The beautiful rooftops of Patan. Meeting Bolle again was so nice and we were both very excited to meet his family, he walked us down the small alleyways away from the square and eventually we made it to his house. Well, when I say house, I really should be saying room. I would be lying if I was to say that I wasn’t a little saddened when seeing his house. Him, his two young sons and his wife all live in one room that is smaller than any of the apartments I’ve stayed in in Korea, they had no running water and had to use a shared outdoor toilet. But they were honestly happier than any family that I know in the western world. 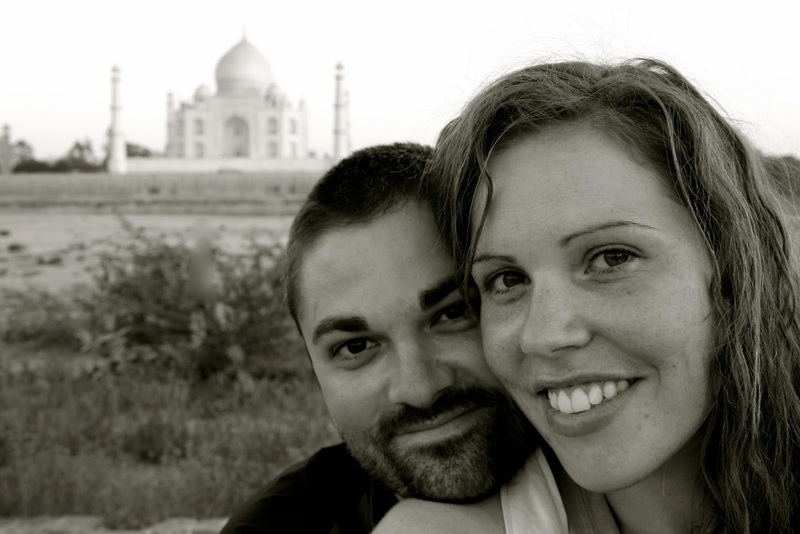 While his wife cooked us dinner, we took his two young boys out and they showed us some local temples and sights. At first they were so shy and didn’t want to be anywhere near us, but once I started taking photos of them and allowed them to use my camera we were the best of friends. Bolle and his two sons showing us the local sights. Believe it or not this is actually a temple! 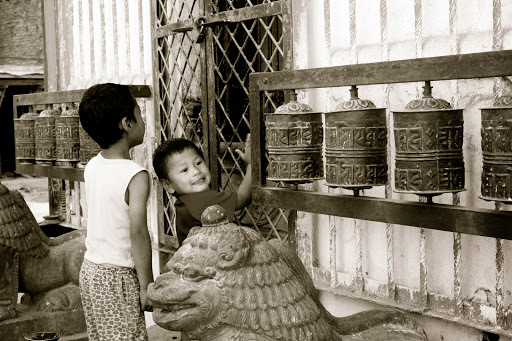 We both loved Patan, especially the area where Bolle lives. 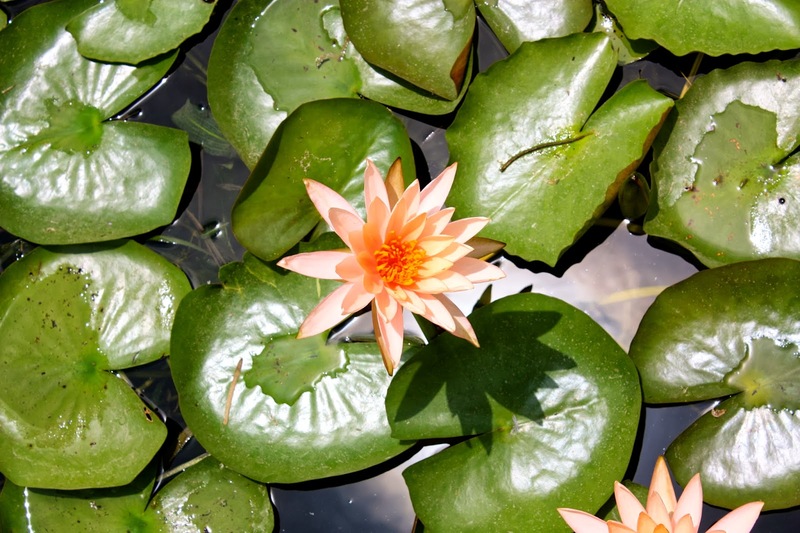 It is so vibrant and full of life. There were ducks, hens and dogs running around as well as little kids. Some ducks in the street. Once we got back to Bolles house his wife had dinner ready for us. 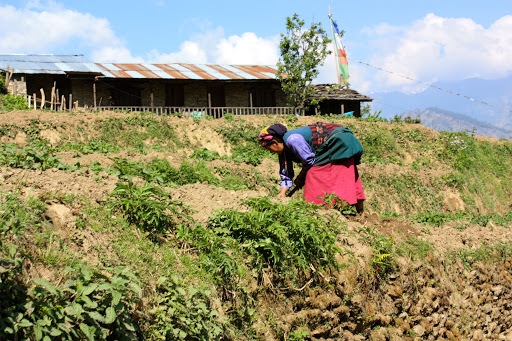 It was the Nepali staple that is Daal Bhat but she had bought a chicken and cooked it for us. We felt so honoured as we know that chickens are very expensive for them and aren’t eaten very often. Dinner was absolutely amazing and the chai that came with it was equally wonderful. We had a great evening and when it was time to bid farewell we arranged to meet up again the next day as Bolle needed to go back to Kathmandu with us. Bolle and his wonderful family. Me playing with the two boys on Bolle and his wifes bed. To get back to our guesthouse we had to walk past the square again. 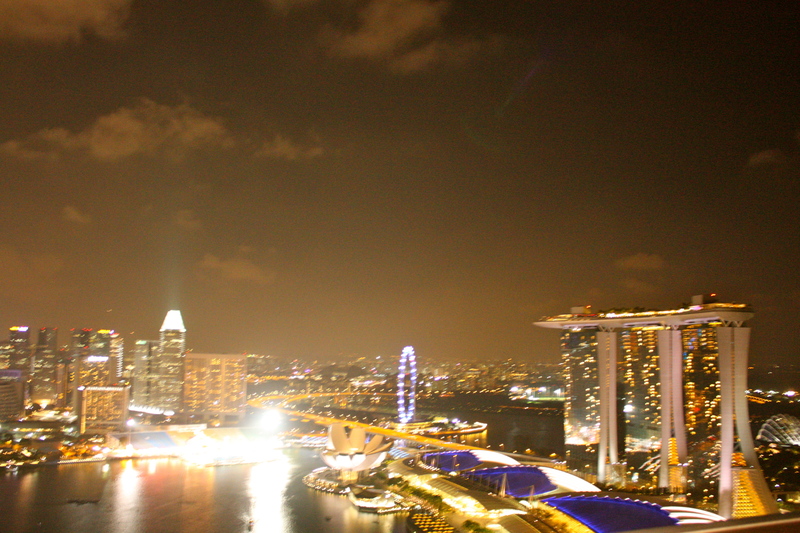 It looked even more magnificient at night with all of the beautiful temples lit up and the travellers gone home. 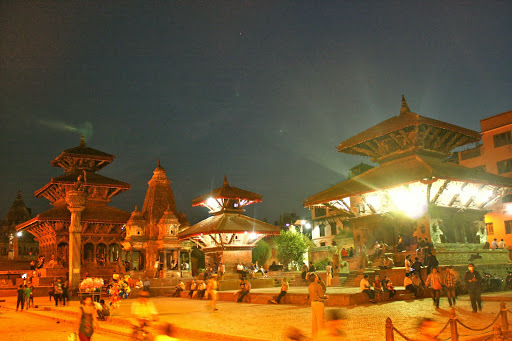 Patans Durbar Square at night. It looks beautiful no matter what time of the day it is. The next morning I woke before 6am. I didn’t want to sit around waiting for Jason at the guesthouse so I got up to go for coffee somewhere. I walked towards the square and realised that nowhere opened until 9 so I sat at the square and watched as Nepali life went on around me. It was interesting to see just how busy the square was with locals coming and going even though it was so early. The square during the daytime. One of the many beautiful buildings in the square. After a while Jason joined me and we ate breakfast. Afterwards we decided to try and find presents for Bolle and his family as a thank you for dinner the night before. We really wanted to buy them a chicken but after searching everywhere we couldn’t find one so we settled on getting some toys for the children. We found a little shop and bought a soccer ball (which was randomly a Dublin Gaelic football! ), an alphabet puzzle and a magic board for drawing on. When we arrived at Bolles house he wasn’t there but his wife was with her friend and her friends child. 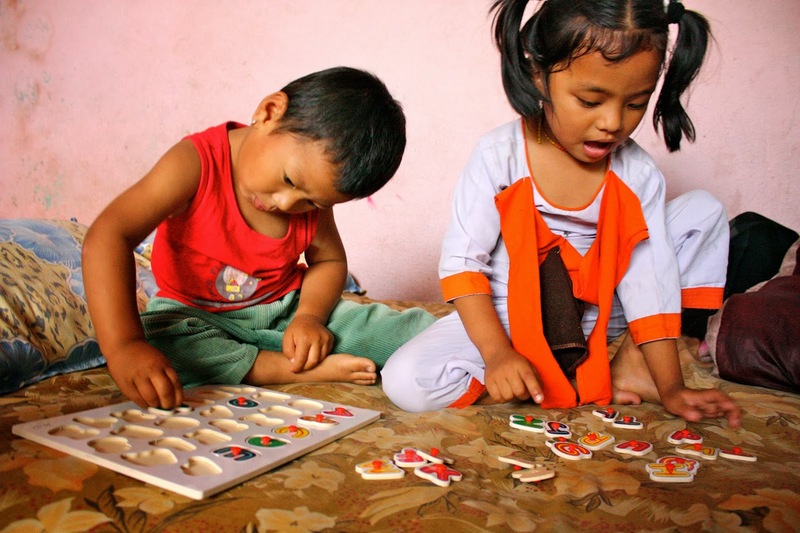 It was a little awkward as they couldn’t speak English and we couldn’t speak Nepali but we gave the youngest son the alphabet puzzle and watched as him and the sweet little girl played with it. They were so happy. Then when it was time to leave they tried to give the toy back to us. We had to try to explain that it was for him to keep, when he realised this he had the biggest smile on his face. Playing with their ABC puzzle. This next moment I’ll never forget for as long as I live. We pulled the ball out and gave it to him and I don’t think I’ll ever be able to explain the joy in his face, I have never seen it before on any other childs face. It was pure shock, happiness, amazement all in one. It really hit us that this family had so little but seemed so happy and when the children get a gift they appreciate it more than any child in the western world would. 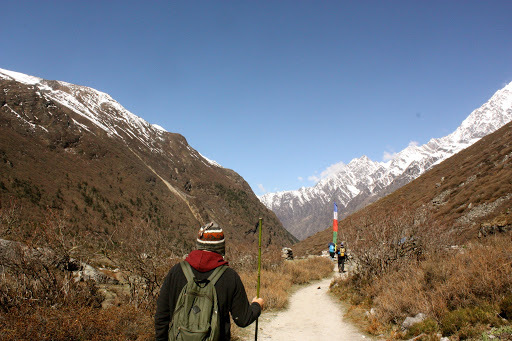 We walked from Kathmandu and it’s a very straight forward route, it takes about one hour. We then took a taxi back into Kathmandu from Patan. Since it’s so close to Kathmandu many people do day trips to Patan so there isn’t a huge selection of accommodation available in the area. The next day was a free day and that morning Bolle offered us a chance to do an additional half day hike to get to an even higher elevation, once again my stomach was aching and I knew that I would be better off trying to get better for our hike back down rather than going higher. But Jason went with him. They had a nice hike and got to know each other better. That day Jason got to 4,000 meters. Kyanjin village from Jasons extra hike. Our guide Bolle taking in the views. We spent the rest of the day walking around the village, taking in the views and visiting the town bakery. 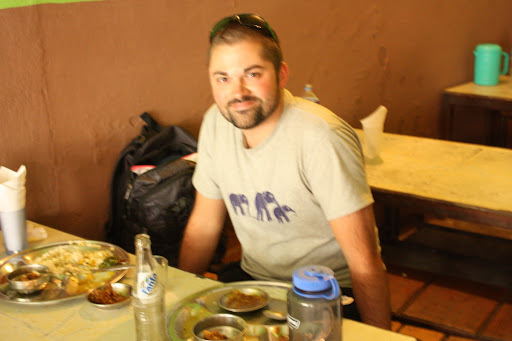 The food on the trek was very basic and every tea house had identical menus so it can get boring very quickly. We were quietly surprised to find the bakery up so high and even more surprised to find that the owner bakes everything himself. We enjoyed some yak cheese pizza and some cake. I hadn’t been able to eat much over the last couple of days so I pretty much just stuffed it down my throat, it was such a good feeling! 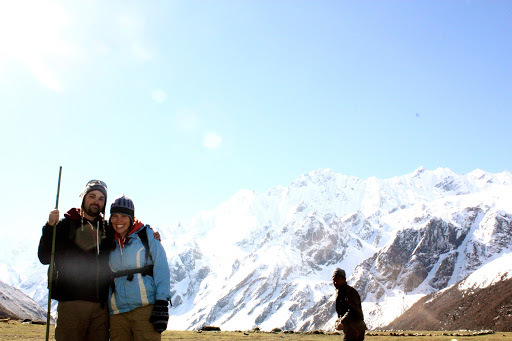 We got photo-bombed by a local in this photo. Day 5: Kyanjin Gompa to A tea house along the river. Our first day of descent was magical. 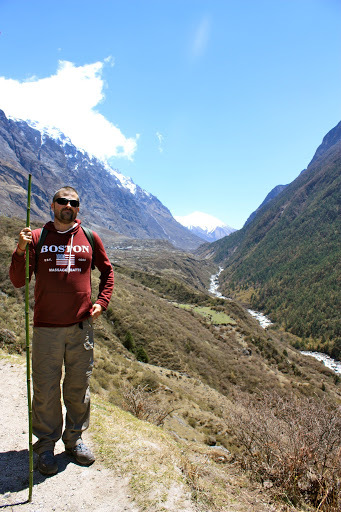 It was such an uplifting feeling knowing that I could walk as fast as I wanted to without having to worry about suffering from altitude sickness. I guess our mistake for this day was walking very fast. The weather was beautiful and there wasn’t a cloud in the sky making the descent beautiful. Initially while walking away from the majestic Himalayas I had to turn my head every couple of minutes to take a look at them, knowing that I may never see such a beautiful sight again. It was a little sad having to walk away from them. After about an hour of trekking we stopped at the Tip Top café. This is a wonderful little café that served real coffee. I ordered a cup and sat drinking it with the finest views in the world. It was one of those moments that I realized just how lucky I am to get to do these things. A coffee with a view! 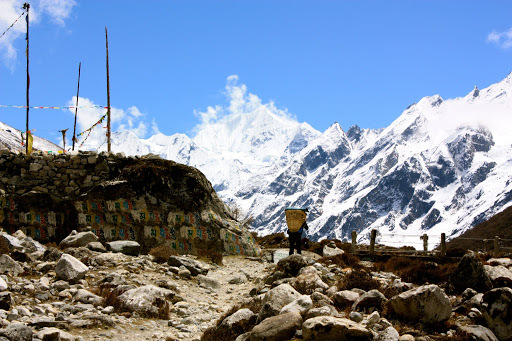 Once we arrived at Langtang village I knew that the view of them would be hidden from me forever and took as many final glances as I could. But now that we were going back down the way that we had come we were given a chance to see the views that we had missed because of the mist and rain on the first two days. 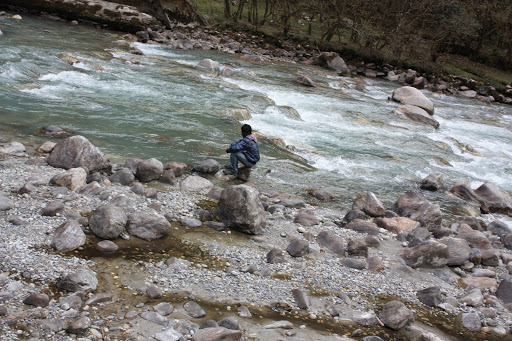 The valley itself is incredible, the river flowing down the middle of it is surrounded by mountains on either side. 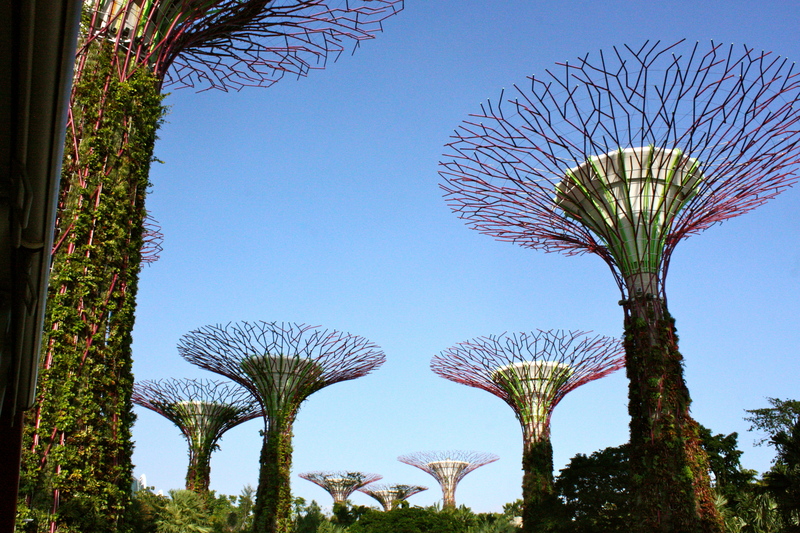 The lush green just makes it postcard perfect. 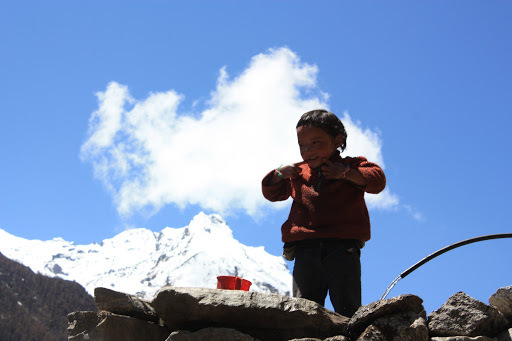 One of the local children near Langtang village. 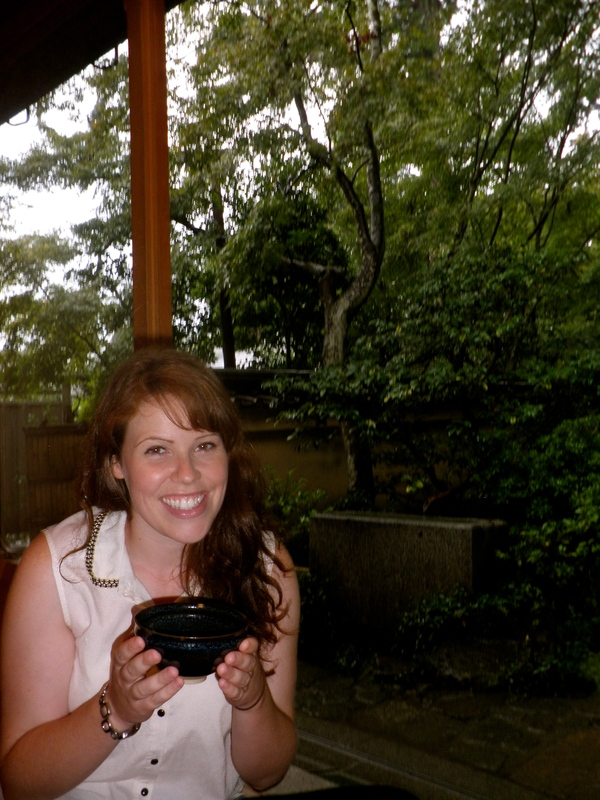 That night we stopped at a delightful teahouse that was right on the river. 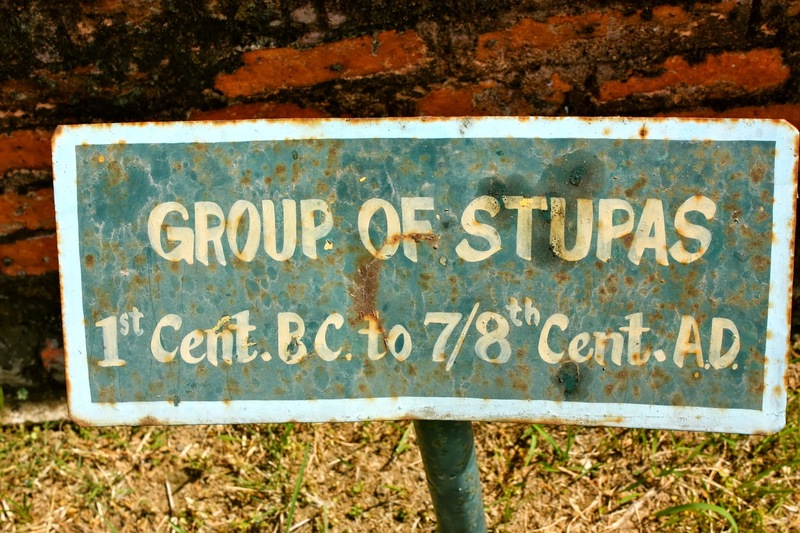 There was also an older couple from England staying there with their guide so it made for a nice little group. We sat outside next to the river chatting and monkey spotting (there were quite a few Lemurs there) and it was definitely an evening that I’ll remember for a long time. Once it got dark we moved inside where once again the fire was lighting. 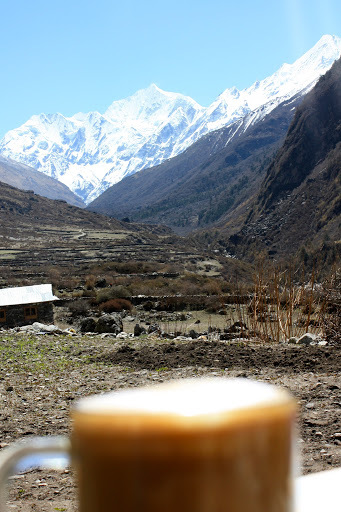 I really do feel that these tea houses are what sets trekking in Nepal apart from other places. The people are locals that have a chance to make some money and you get to stay in a locals house and learn a bit about how they live. On our way to our tea-house. Bolle and Jason sitting by the river. Day 6 Tea House to Thulo Syabru. Waking up that morning was torture. After doing a full day downhill the day before we both woke up with aching bodies. I had pains in places that I never knew existed. Also we both thought that today was another day of downhill but how wrong we were! This day will definitely go down as the toughest day of the trek for me. We continued on downhill for another 3 hours and had lunch at the hot springs. While having lunch we had chickens running around under our feet. After lunch we had another 40 minutes downhill backtracking the way that we had previously come. Then came the turn off to Thulo Syabru. To get to Thulo Syabru we had to climb straight uphill in the sweltering heat for about 2 hours and to make matters worse our muscles were still aching and we had run out of water. The views from the top of the grueling hike. That climb was by far the toughest climb I had to do on the entire trek, it took everything out of me and at one stage Bolle ran up to the top ahead of us and bought us some drinks at a little shack that was at the top. Once we had some drinks in us we felt better and made it to the top. 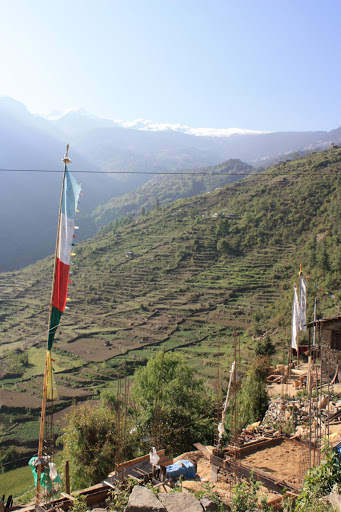 We relaxed at the little shack for a while and drank more and more drinks, the views were beautiful and we could see Thulo Syabru from there…then came the most heartwrenching part of the trek. After resting we walked for a bit and I saw the only way to get to Thulo Syabru was to cross a bridge. Meaning we had to climb back down to the bottom of the mountain, cross the bridge and climb back up on the other side. 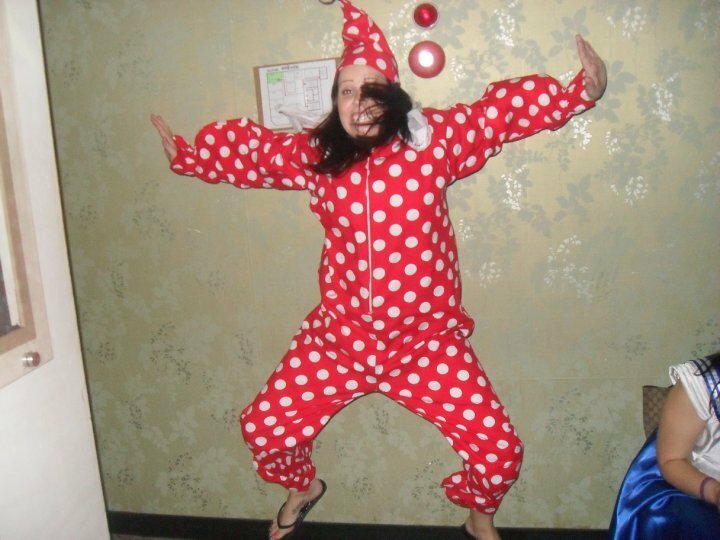 I’m not proud of what I did next but I may have stomped my feet like a four year old in frustration. 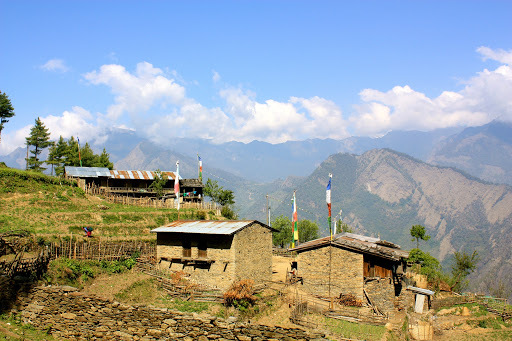 Some of the houses on the way up to Thulo Syabru. 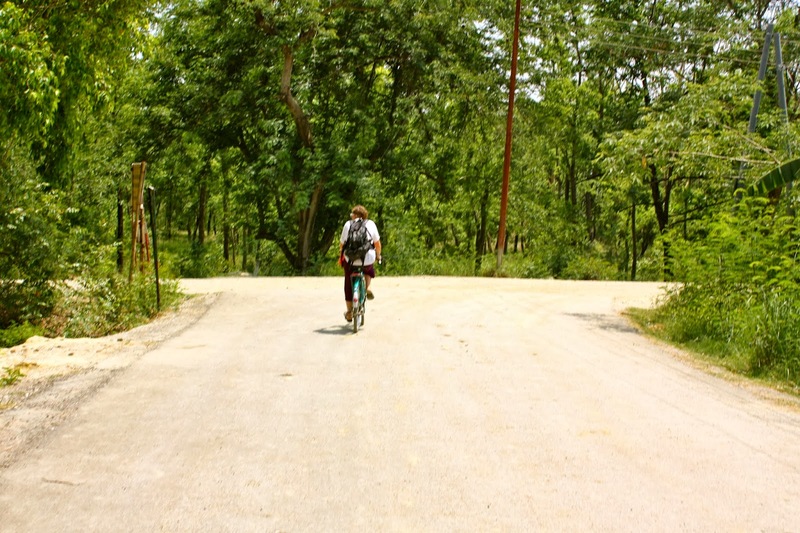 This next part seemed easier than before as it wasn’t as hot and we had water and we had an ending point up ahead. We also had the porters from the big Korean group keeping us company. 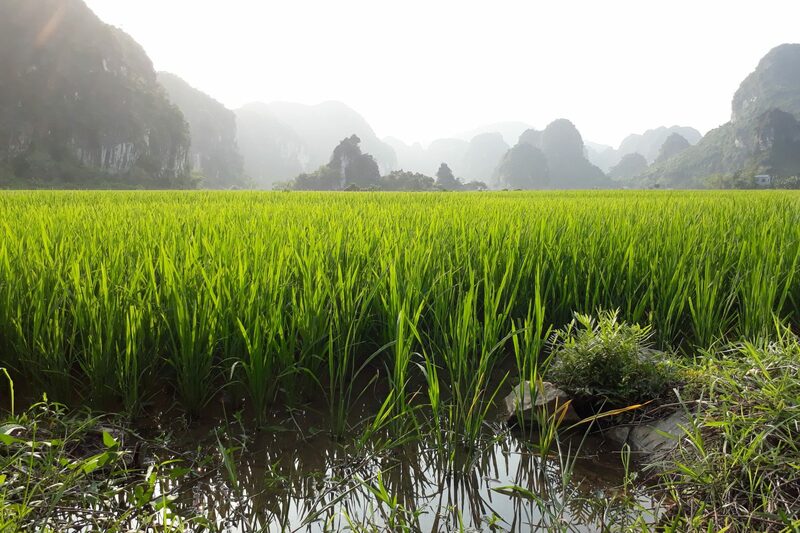 Once we finally made it to Thulo Syabru we were pleasantly surprised, it was a beautiful little village surrounded by rice paddies as far as the eye could see. It was also full of cobbled old streets and had many children around playing. 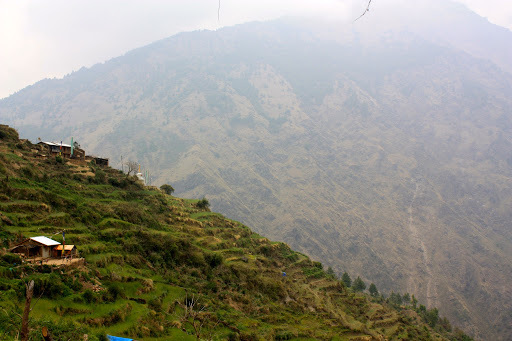 The tea house that we stayed in that night was by far the best that we had had for the entire trek…why? Because I was FINALLY able to have a nice hot shower! I must have showered for about 40 minutes but it was so good. 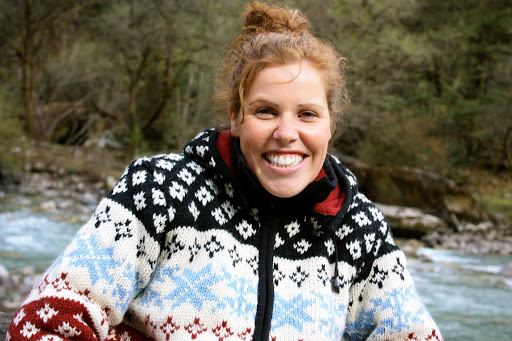 While at our highest point of the trek I had to have a cold water shower in an icy cold bathroom and then get dressed in our icy cold room, it was torture, so this was the best present that I could wish for. The last day of our trek was finally upon us. We woke up to an incredible view of the Himalays in the distance from our bedroom window. It felt strange knowing that this was going to be our last day, it almost felt like a way of life now. 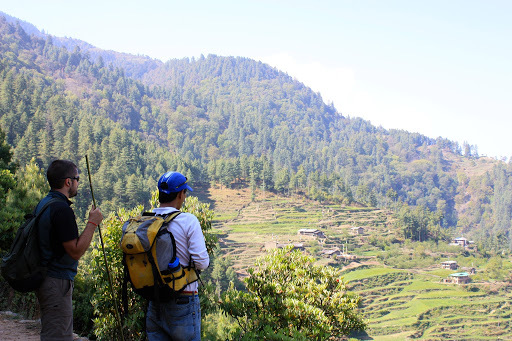 But we had made plans to meet up with some people that we had met on the trek and eat a big steak dinner when we got back to Kathmandu so we were getting excited about that. Our view from the bedroom the next morning. Beginning our final day of hiking. Thulo Syabru was beautiful except for one thing…the flies. There were flies EVERYWHERE. I would see old ladies sitting on the ground in the street with hundreds of flies on them, the same with the dogs. I don’t know why there were so many but it made eating nearly impossible, especially eating a pancake with jam on it, you’d look down and see about 10 flies on the pancake and another 30 or 40 on you! This last day of hiking was enchanting. This route isn’t taken very often so there was only one other small group of trekkers on the route. 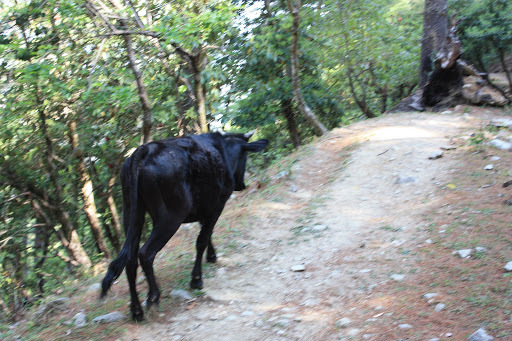 It was very peaceful walking through the forests and seeing cows, sheep and goats on the path. We also came across many farms and farm houses. There were so many monkeys on this route also. 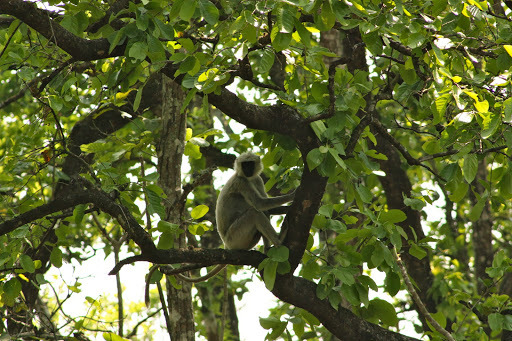 While in the forest all of a sudden you look up and there could be 12 lemurs on the branches above you. After about 2 hours of going through the forest and farms we came to the road. We would walk on the road for the last 2 hours ever of our hike. While on the road we came across buffalos, children swimming naked in the river, old men resting on the side of the road while hearding their goats/buffalos. People from the surrounding villages walking to and from. We even came across a man and his young son chasing their 2 pigs that had somehow escaped. Jason and Bolle looking out at the many rice paddies that layer the mountains. A random cow on the trail. A woman tending to her crops. A mother and son at one of the final tea-houses that we stopped at. The mountains nearby were so beautiful. It was a lovely day. Unfortunately for poor Dundee (our porter) our bags were heavier that day and he was feeling sick so the trek was hard for him that day, luckily he flagged down a passing truck and got a lift to our final destination. 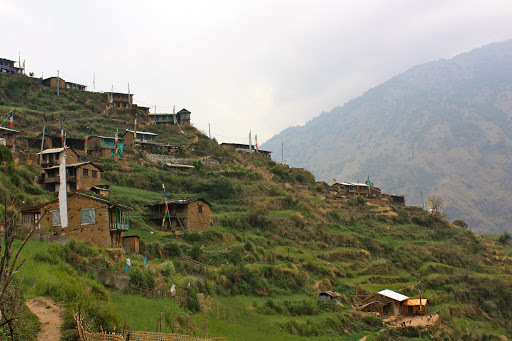 Once we arrived in Dhunche it was such a strange feeling, we were ecstatic that we had completed the trek, sad that it was over and nervous about the next days bone knuckling ride to Kathmandu. That evening we bought both Bolle and Dendee a big Everest beer and spent the evening playing card games. We also had Dhal Bhaat for dinner and Bolle and Dendee taught us how to eat it Nepali style…with our fingers. Jason was a pro at it (I think the child in him was delighted to be able to eat his curry with his fingers) Me; not so good. It was great fun all the same though. Jason eating some Dhal Bhaat. That evening we also had to say goodbye to our wood sticks that had gotten us through the 7 days of trekking, it was strange to know that they wouldn’t be glued to our hands anymore. Day 8 Dhunche to Kathmandu. 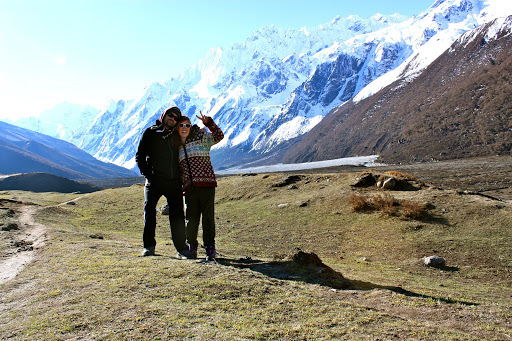 The day to return back to Kathmandu was upon us and we were both excited to get back to a comfy bed and a steak dinner but I was also apprehensive about the bus journey back since the one to there was quite scary. Luckily the weather was good for us which meant that we had no near death experiences and arrived in Kathmandu 2 hours before we expected to. 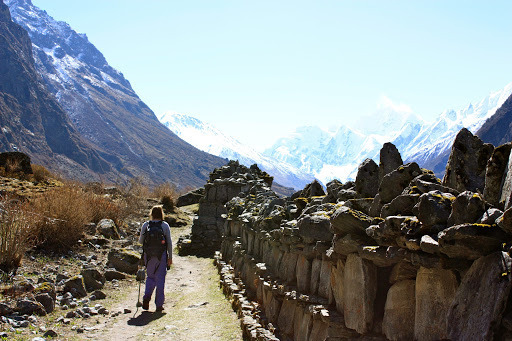 Overall our trek was an amazing experience. 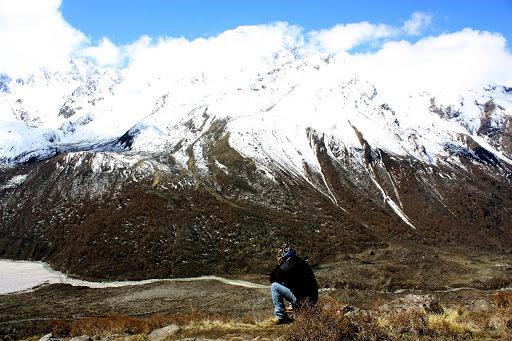 The Langtang trek offers a quieter trekking experience with fewer trekkers compared to the EBC and Annapurna treks. It also offers a diverse landscape, starting with the beautiful lush green forests and then to the more sparse higher elevated areas. 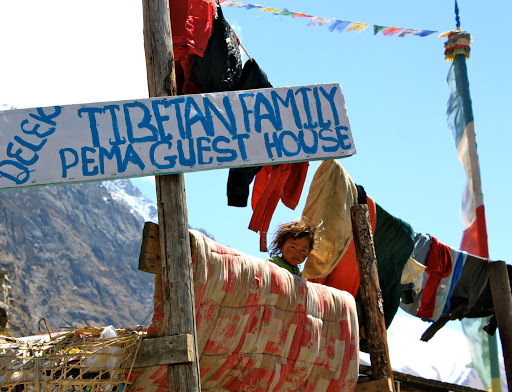 There are tea houses everywhere so you are guaranteed a comfortable nights sleep throughout the trek. 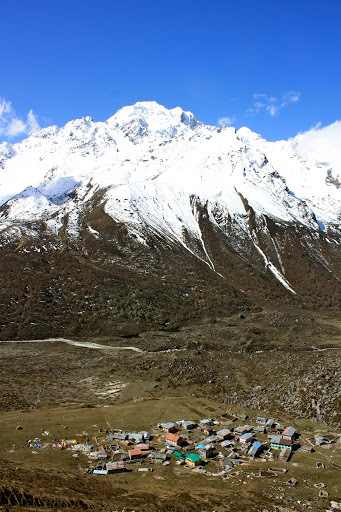 Also if it’s yaks that you are interested in seeing then Langtang is the place for you; we saw quite a few of them and apparently there are no yaks on the Annapurna trails. But saying that, whatever trek you choose I have no doubt that it’ll be just as beautiful and awe-inspiring as ours was. 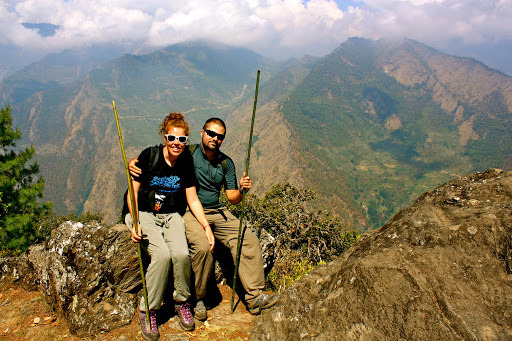 Exotic Mt.Treks: They were very honest and really seemed to want to help us in the best way possible. I’d definitely recommend any travelers to use their services. There are some trip advisors reviews of them here. 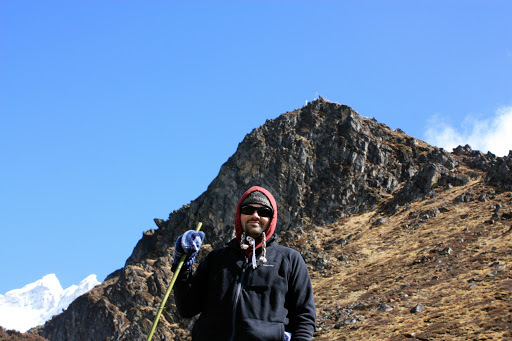 He was a highly qualified guide who always had our best interests at heart, he always had a smile on his face and became a good friend during our trek. His English is also great. Hint: if you book with him directly you will be able to cut out the agent fees and save some money.